Hi there. Welcome to Paul Evans's personal website. There's information here about Paul Evans and the various things I'm involved in. 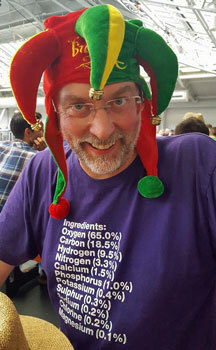 The photo is by Mark Jones (who also provided the hat) and was taken at the Great British Beer Festival in August 2016. If you don't find what you're looking for here, you can e-mail Paul Evans from this link. I welcome comments and feedback on the site, too – I give it a polish every now and then and will take your comments into account. There are a lot of us about. Here are some biographical notes about this Paul Evans to help you work out whether I'm the one you're looking for. I've also got information about some other Paul Evanses. I admit it, I'm a gamer. Board games, role-playing games and play-by-mail games but not computer games. Here's more about the games I play. Until 2011 I ran UK games distributor MnP Games Distribution. I published a new edition of En Garde! – the swashbuckling game – in 2005. Since 2004 I've been operating Games from Pevans: my online games shop, supplying board and card games by mail order. I also write games reviews and articles and publish my own magazine, To Win Just Once. Page created 3rd January 2000. Last modified 12th April 2019.